First We Feast points us to a story about Burger King in Israel offering the SufganiKing on its menu this month. It’s a hybrid of the Whopper and a sufganiyah, the round jelly doughnut eaten during Hanukkah. In place of fruit jam, the SufganiKing would feature ketchup, of course. Everyone: Engage your disgust and faux outrage now. 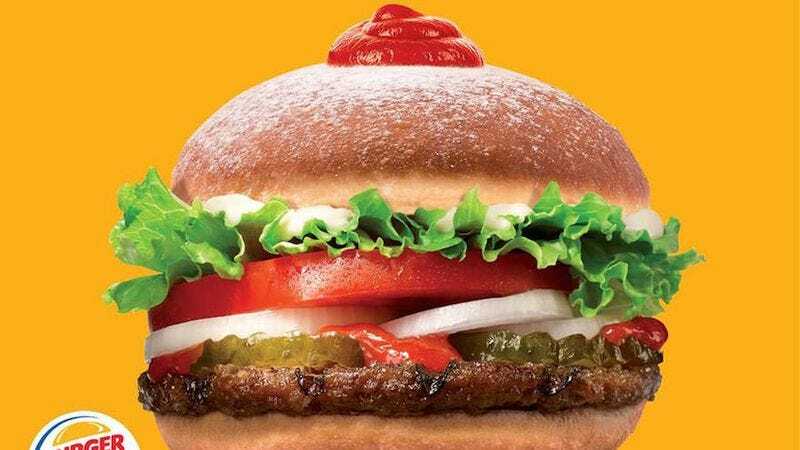 OK, now that the shock of “ketchup,” “doughnut,” and “Whopper” appearing in the same provocative headline has worn off, let us explain why this is actually a great idea. The issue of your kneejerk disgust is the pairing of the word doughnut with ketchup—Westerners associate doughnuts as sweets filled with Boston creme and fruit-flavored jellies, or glazed with icing. But doughnuts are really just dough fried in hot oil, and there are more examples of savory treatments than sweet. Native Americans in the Southwest have been frying bread for generations and serving it alongside chili stews (Fry bread taco is a recent innovation). Southeast Asians have long enjoyed a a deep-fried footlong cruller called youtiao in Chinese, typically dunked in rice porridge congee with pork, ginger, thousand-year eggs and other salty ingredients. One of the tastier interpretations of a savory doughnut is the Japanese kare pan, a greasy, chewy, deep-fried bun with meat and curry sauce in the middle, found in most neighborhood bakeries. In 2006, the Gateway Grizzlies baseball team outside St. Louis garnered national attention not for its on-field performance, but for selling a Krispy Kreme burger (a.k.a. Luther burger) in the ballpark. Dubbed “Baseball’s best burger,” it’s a 1,000-calorie bacon cheddar burger sandwiched between a grilled Krispy Kreme doughnut. This is essentially what Israeli Burger Kings are doing. It’s not as outrageous as it seems. What we’re advocating here (skip the next paragraph, cardiologists) is that baked buns, while helping maintain sandwich structural integrity and some semblance of healthiness, are a downright bore next to a bread that’s fried. Think of beignets, zeppole or pizza puffs—the interior comes out airy and soft, while you get that added richness from the crisp, oil-slicked exterior. Not such a crazy idea anymore, eh?